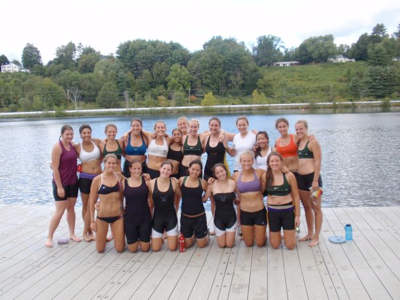 All three Dartmouth Rowing teams have now raced at least once, and with the fall season halfway over, it’s time to take stock. The coaches have done so below. If you’re signed up for the Dartmouth Rowing feed on Twitter or follow the program on Facebook, you know the results of the Head of the Charles and Princeton Chase already. If you haven’t or don’t want to follow the team via the wonders of social networking, rest assured that we’ll continue to provide race recaps in this format, as we always have. Heavy, wet snow and wind made for nasty racing conditions at the Charles this year. Our crew clocked a decent first mile, but shifted out of attack and into survival mode entering the power house stretch. Numb hands combined with lack of fitness and technical prowess yielded a disappointing result – perhaps the kick in the pants this team needed to feel some urgency. The Princeton Chase was a good step forward as well as a measure of just how far we have to go to be competitive. Most of our juniors are away on off-terms, which leaves 5 seniors, 3 juniors and 14 sophomores on campus right now. The sophomores are a spirited and dedicated group, but they are “green” in every sense of the word. With so few upperclassmen to actively lead the team, we’re making progress, but it’s slow. It’s important to note that we’re only in our fourth week of training this term, and patience is a virtue. We’re taking the time we need to get everyone up to speed technically and physiologically. We remain focused on building a solid platform for boat speed in the spring season. The Charles eight felt pretty good through the first quarter but we weren’t able to hold it together for the rest of the race—everyone agrees that the conditions seem to have gotten the best of us. After racing in both eights and fours, the team left Princeton happy with our progress over the course of one week but also knowing we still have a lot of ground to make up. We’re excited to shift into small boats for the next three weeks to prepare for better racing at the Foot of the Charles on November 14. We’re a young squad. With most of the juniors gone (including three from last year’s varsity), the sophomores are more than half of the team. This makes now a good time to focus on the individual development that will allow us to compete later in the season. Each rower has individual performance goals on the ergometer, a plan to help them achieve those goals, and “benchmark” targets along the way. We’ve also used heart rate training to target steady state efforts on the water and lots of miles in pairs and fours to encourage solid technique. I’m pleased with the development of our rowers thus far. “After a solid four weeks of rowing this fall in small boats, fours, and eights, we headed down to Princeton excited to race for the first time this season. The tension, thrill, and emotion of race day surged throughout the team as we unloaded boats, rigged them, and practiced quickly on Lake Carnegie in unusually warm and rainy weather. Much of our team eagerly anticipated racing as varsity rowers for the first time. While most of our juniors are off-campus, the sophomores have already adjusted well to the varsity squad--their contribution and presence this fall has been significant. The Lightweight Men brought one eight-oared crew to the Head of the Charles. The boat finished 16th of 21 in a time of 16:29.7, rowing 30 spm with good spacing. That result was 11th of the 12 EARC crews racing. As bad as that may seem, I was pleased. The crew did what was asked of them, they went hard, and our speed/cadence ratio was good. We simply are not yet capable of the 34 – 36 strokes per minute racing of our competitors. We will row 36 spm when we are well-prepared to do so, and might take some hits along the way. Last Sunday was our second, and last, race of the Fall, the Princeton 3-mile Chase. We raced two eights, and then those rowers doubled up into four fours. Our “A” crew finished 13th of 31 while “B” was 29th. The good news is that we were 9th of the 12 EARC schools competing, an improvement of two from the week before. At that rate, we’ll be at the top of the league by the end of November! Line-ups for the fours were mixed, with a senior/junior crew placing 21st of 39, besting a sophomore boat in 22nd by 5 seconds. Other crews were 30th and 35th. That’s enough racing for the fall. We’ll stay at home and train on the water until the Saturday before Thanksgiving. There is much work to do on fundamental motion, connection, and fitness. The team is eager, and understands our need to build a base from which speed can develop. That is our task.